IT help desks, and customer service organizations in general, exist to help their customers solve problems. Sometimes, the people who run those organizations forget. Only by instilling the right culture and beliefs can you ensure that your help desk truly helps. Contempt does not create a good customer experience, although it might create third-degree burns. Many a frustrated technology user has run into those responses when seeking help. Working on a help desk is a tough job. Users constantly demand and complain, and each problem they bring is as likely to be of their own making as not. It’s not the help desk guy’s fault that software can be hard to use, or that Windows crashes without explanation, or that computers are inherently complex. Nevertheless, the entire organization’s frustrations get dumped in his lap. 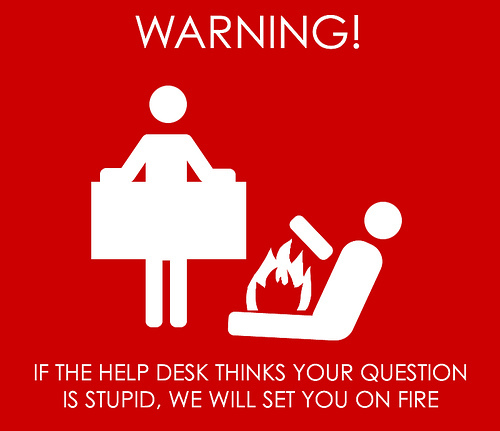 No wonder, then, that the help desk staff can become a bit defensive or dismissive. There’s a huge backlog of people waiting for help, of systems waiting to be rebuilt and printers waiting to have their toner changed. There are problems that affect the whole company, problems that will immediately incur the wrath of the executive suite. Why should he focus on a unique problem presented by a single lonely user? Far easier to dismiss the problem as a one-off and ignore it. It’s probably the user’s fault anyway. When a help desk staffer defends his workload against your unique issue, he’s actually attacking you. He’s attacking your knowledge and credibility (“that person must just not understand computers”) and your importance (“because this only happens for you, and you’re not my boss, this doesn’t matter.”) The end result creates double damage: not only does he fail to fix your problem, he’s implicitly insulted you and made you feel unimportant. Share ownership of the problem, no matter who you think may be responsible for creating it. You’re running the help desk, not the judgement and condemnation desk. Every problem is real, even if you can’t easily reproduce it. Some problems are tricky to re-create, but that doesn’t make them any less real. Every problem is important to the user (or customer) who has it. A problem that affects one customer is just as challenging to that one as a problem that affects hundreds of customers. A new problem is still a problem. Figuring it out now for the first user who has it may serve you well if it starts showing up for others. Your users aren’t (generally) stupid, they’re just busy and this isn’t their area of expertise. Contempt never produces a good customer experience, so step into the user’s shoes and understand how it looks from her end. Every user is important. Even when the problem turns out to be self-inflicted, a user will appreciate the person who gently helps him figure it out. Some help desk staff exhibit these behaviors naturally, while others crumble quickly when the workload gets big. Create your help desk culture by design, not default, and train these behaviors into your people from their first day on the job. You’ll be glad you did.